Q1. When a deuterium nucleus and a tritium nucleus overcome their Coulomb barrier and fuse together they may be considered as charged spheres in contact. The constant ro which relates the nuclear radius, R, to the cube root of the mass number A may be assumed to be 1.3 fm. (i)	Calculate the radius of the deuterium nucleus RD and the radius of the tritium nucleus RT before fusion. (ii)	Calculate the minimum energy, in MeV, which must be supplied to the deuterium nucleus and the tritium nucleus when they fuse together. (b)	Estimate the temperature at which deuterium and tritium nuclei would have enough kinetic energy to undergo fusion. (a)	Show that the kinetic energy of an α particle travelling at 2.00 × 107 ms–1 is 1.34 × 10–12J when relativistic effects are ignored. (b)	Calculate the closest distance of approach for a head-on collision between the α particle referred to in part (a) and a gold nucleus for which the proton number is 79. Assume that the gold nucleus remains stationary during the collision. (c)	State one reason why methods other than α particle scattering are used to determine nuclear radii. Q3. 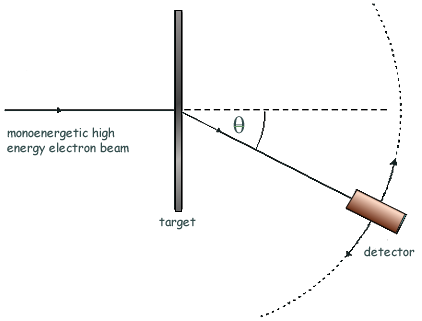 Nuclear radii can be determined by observing the diffraction of high energy electrons, as shown in the diagram. 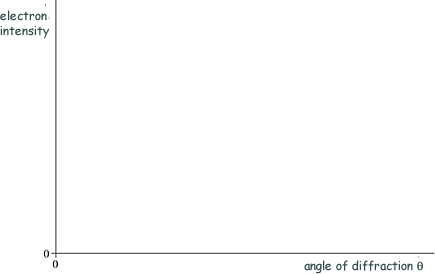 (a)	On the axes below, sketch a graph of the results expected from such an electron diffraction experiment. (b)	State why high energy electrons are used in determining nuclear size. (c)	Electron diffraction experiments have been performed on a range of different nuclei to give information about nuclear density and average separation of particles in the nucleus. Give the main conclusion in each case. (d)	Sketch a graph of the relationship between the radius of a nucleus and its nucleon number. (e) Given that the radius of the nucleus is 3.04 × 10–15m, calculate the radius of the nucleus. The table lists values of nuclear radius for various isotopes. (a)	Use the data to plot a straight line graph and use it to estimate the value of r0. (b)	Assuming that the mass of a nucleon is 1.67 × 10–27 kg, calculate the approximate density of nuclear matter, stating one assumption you have made. (a) On the graph paper below sketch a graph to show how the radius, R, of a nucleus varies with its nucleon number, A. (b) The radius of a gold-197 nucleus is 6.87 × 10–15 m.
(i) Show that the density of this nucleus is about 2.4 × 1017 kg m–3. (ii) Using the data from part b(i) calculate the radius of an aluminium-27 nucleus, . (c) Nuclear radii have been investigated using α particles in Rutherford scattering experiments and by using electrons in diffraction experiments. Make comparisons between these two methods of estimating the radius of a nucleus. Detail of any apparatus used is not required. The quality of your written communication will be assessed in your answer. Q6. 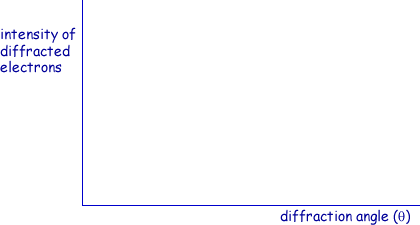 The high energy electron diffraction apparatus represented in the diagram below can be used to determine nuclear radii. The intensity of the electron beam received by the detector is measured at various diffraction angles, θ. (a) Sketch on the axes below a graph of the results expected from such an electron diffraction experiment. 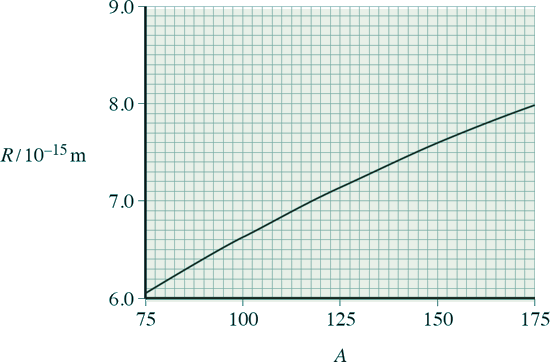 (ii) Estimate the value of r0 from the graph. (c) Discuss the merits of using high energy electrons to determine nuclear radii rather than using α particles. (a) Scattering experiments are used to investigate the nuclei of gold atoms. In one experiment, alpha particles, all of the same energy (monoenergetic), are incident on a foil made from a single isotope of gold. (i) State the main interaction when an alpha particle is scattered by a gold nucleus. (ii) The gold foil is replaced with another foil of the same size made from a mixture of isotopes of gold. Nothing else in the experiment is changed. Explain whether or not the scattering distribution of the monoenergetic alpha particles remains the same. (b) Data from alpha-particle scattering experiments using elements other than gold allow scientists to relate the radius R, of a nucleus, to its nucleon number, A. (i) Use information from the graph to show that r0 is about 1.4 × 10–15 m.
(ii) Show that the radius of a nucleus is about 5 × 10–15 m.
(c) Calculate the density of a nucleus. State an appropriate unit for your answer.